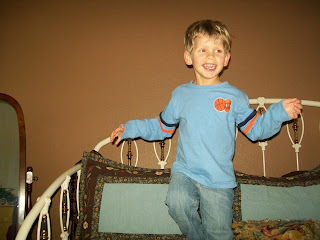 Dawson being silly as he gets ready to leap off the bed. 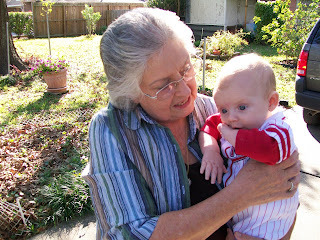 Dawson with his Aunt Elizabeth. 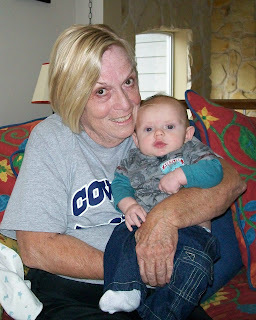 Aunt Julie, Aunt Elizabeth, and Dawson. 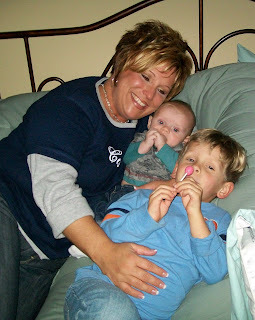 Aunt Julie and both boys lying on the bed. 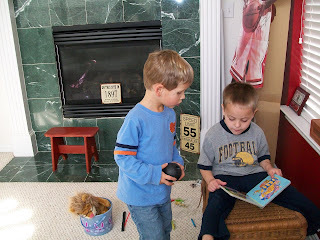 Dawson and Chance (cousins) looking at a book. 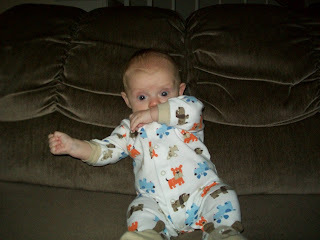 Brady is now 3 months old and SOOOO adorable!! Look at that face! 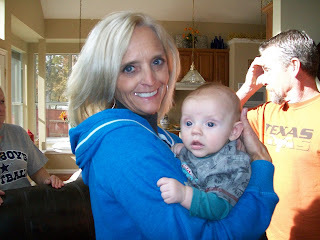 We had Thanksgiving with my family last week and everyone was happy to see and hold Brady. He seemed to like all the attention and didn't mind being passed around at all. Even Lily the dog enjoyed Brady. 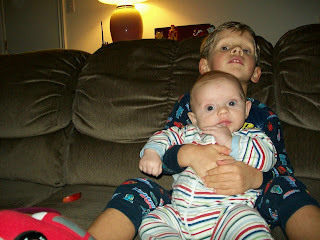 The boys hanging out on the couch after bath. 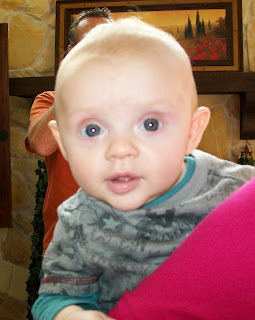 Brady looking up at me with those big beautiful eyes. 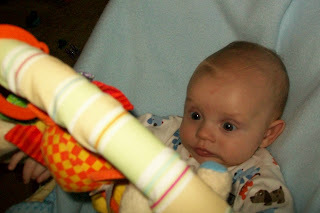 Brady looking wide-eyed at one of his toys, obviously very interested in it. 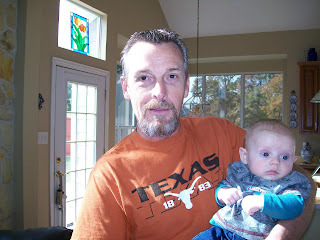 Randy is such a wonderful father and I am extremely thankful for all that he does with the boys. 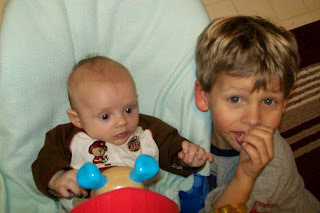 Every Saturday he and Dawson enjoy some quality time together and allow me to have some time to myself. Once or twice a month, Randy will take Dawson out for a really fun day at Incredible Pizza. 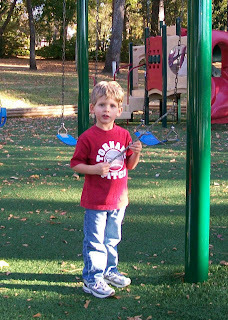 And he spends a lot of time at home with us, playing with Dawson and Brady. He is a very involved dad. What I really appreciate lately is how much Randy helps with Brady at night and in the early morning hours. 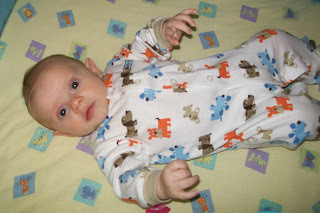 Brady is not a good sleeper and continues to wake up about every hour and a half or two hours, with only an occasionally 3 hour sleep period. 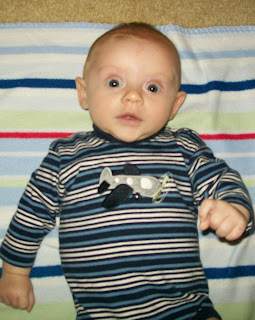 It is extremely exhausting to wake up so frequently to feed Brady and then be alert and playful all day with the boys. Thankfully, Randy helps out and allows me to get a little extra sleep. 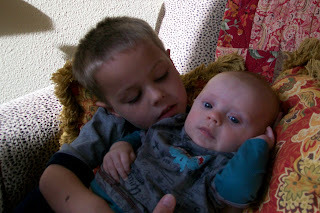 He'll frequently take Brady when he wakes up in the early morning and lets me sleep in. 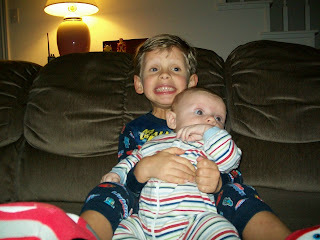 And the other day he took care of Brady ALL NIGHT. This morning I thought Brady had slept for 5 hours, only to find out that he had woken up twice in that period and Randy had fed him and taken care of him. I just want everyone to know how wonderful and kind Randy is, how much he helps out with the boys, and how thankful I am for him. 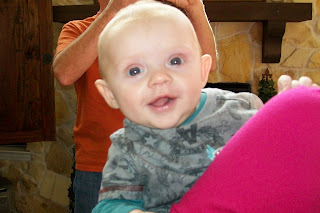 A sweet smile from my sweet baby. Looking so cute lying in his chair. 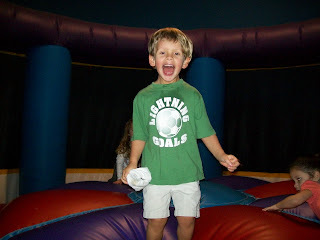 I snapped this picture right before Brady tipped over. 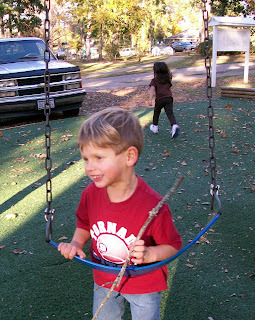 Holding a stick he found at the playground. 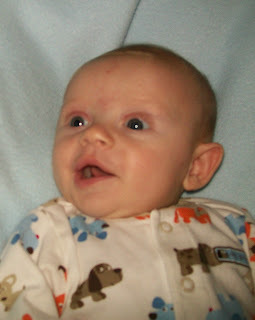 Laughing at his friend, Carson. 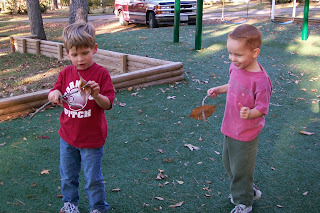 Dawson and Carson poking their sticks through a leaf, which they thought was the coolest thing. 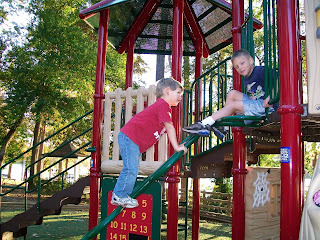 Climbing up the ladder and talking to Nate. 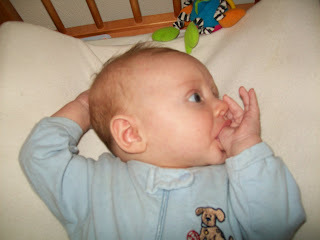 Brady has been trying valiantly to get his thumb in his mouth recently. He's done it a few times and is soothed by the sucking. It looks like he'll be a thumb-sucker like Dawson. 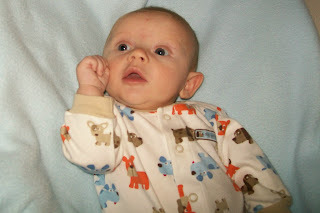 Brady looking super cute, lying in his crib looking around. 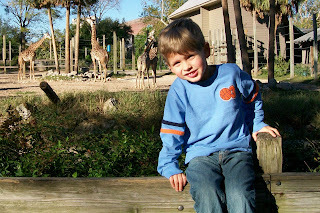 Last weekend we went to visit Randy's parent and stopped by the Houston Zoo on our way home. 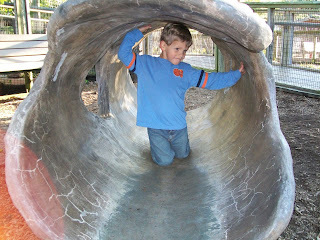 It was a beautiful fall day and we enjoyed seeing the animals and playing in the children's zoo area. 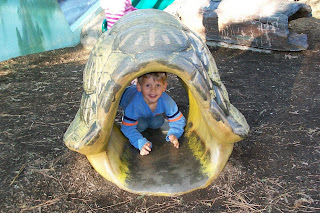 Dawson inside a big turtle shell. Crawling through a big tree. Hanging out by the giraffes. 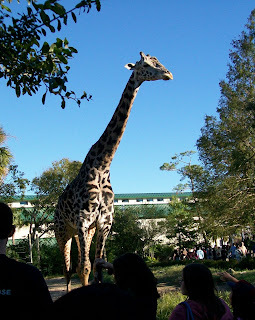 A great big giraffe looking out at all the people. 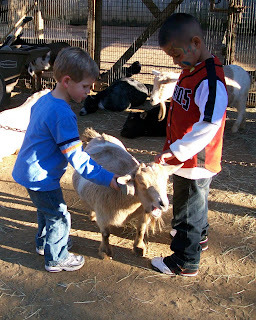 Brushing one of the many goats at the petting zoo. 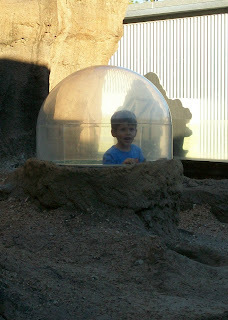 Popping up in the prairie dog exhibit. 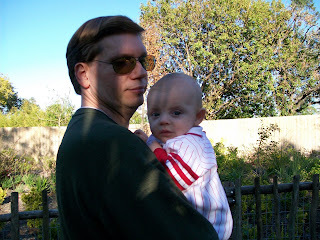 Brady and Dad at the zoo. 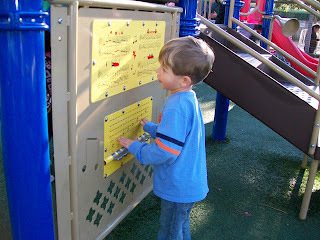 Playing the musical keys at park a the children's zoo. 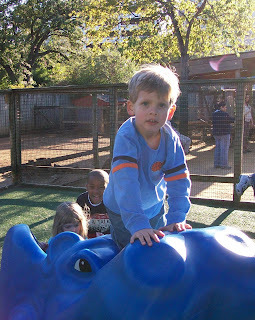 Climbing on the hippo at the park. 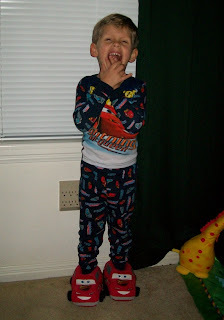 Dawson in his new Cars pajamas and slippers. 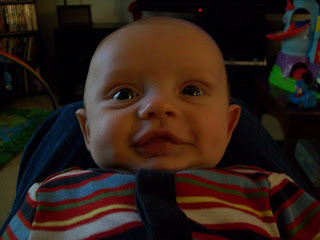 His big, open-mouthed, toothless smile. Hearing him talk to us. His ooh's and ahh's are so precious! How much he loves to look in the mirror and smile at his image. 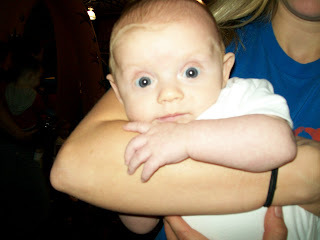 The way he grasps onto us when we hold him. He'll put his arm around us and grab onto our shirt and hold on tight. How much he loves to be held and cuddled. 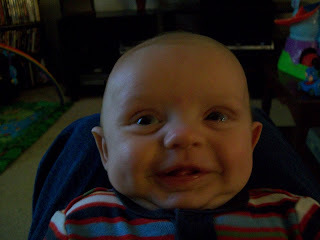 Brady laying in Dad's lap and smiling up at him. 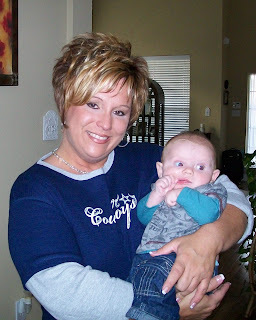 Angie holding sweet little Brady. 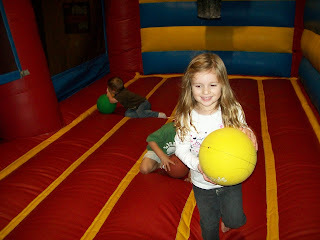 Angie and I took the kids to Pump It Up on Friday and they had a great time jumping on all the inflatables and sliding down the giant slide. 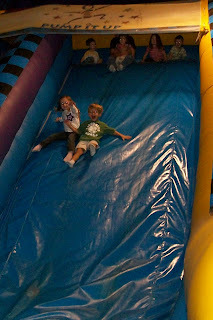 Kaelin and Dawson sliding down the slide together. 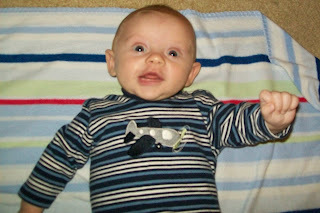 Dawson playing in the basketball jumper. 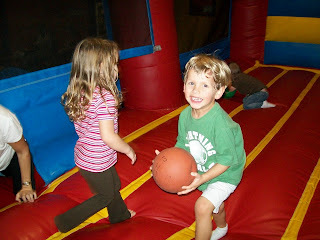 Kaelin jumping and playing basketball. 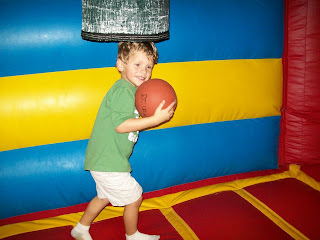 Another cute picture of Dawson playing basketball.